Your Create website has the facility to let you have customer or user accounts on your website. You can use this as part of your shop to allow customers to register accounts which will store their address information and order history, or you can use it anywhere on your website to password protect certain pages. In this guide we will be covering the ways in which you can use our user accounts facility and how you can apply it to your website. To allow your shop customers to register an account, to monitor their order history and save their address information. Useful if you have an online shop, to make purchasing even easier and faster for your customer! To password protect any pages of you website. 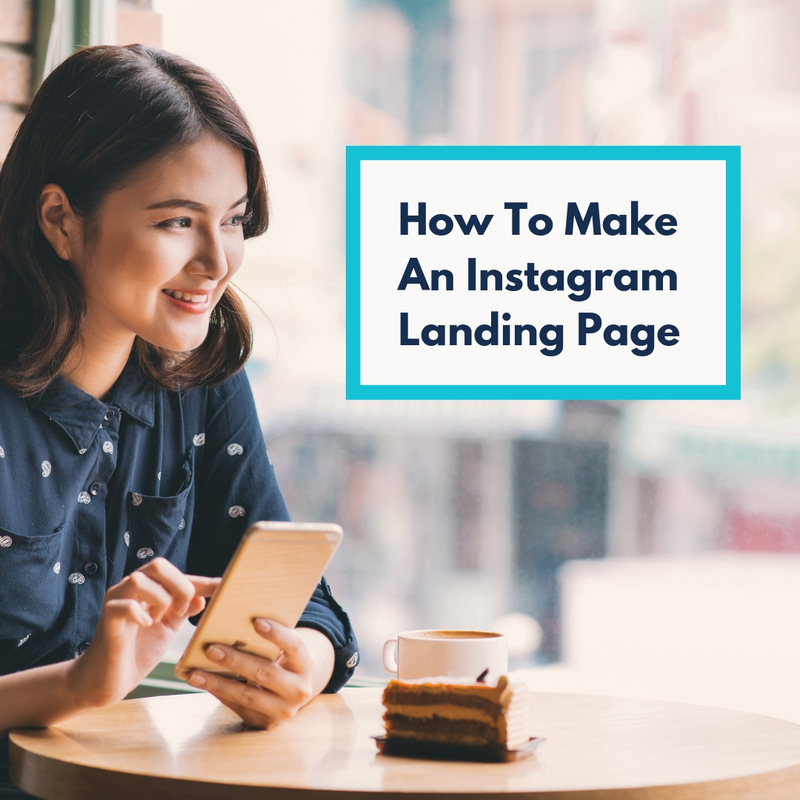 This is great if you want to share some work with only certain clients such as photos, or perhaps share your company news and events with your website users only. To password protect your shop, so only website users can access or see your products. Handy if you want to sell wholesale and only allow retailers to see your products. By default, there is a "customer login" link on your shop pages. If you do not have a shop, or you want a customer to be able to log in from any page of your website. Click the icon "Block Settings", which is situated next to the save button. Do you want customers to be able to register themselves? If you don't want your customers to be able to register themselves with your website, you can remove the "register an account" link. This way, only you will be able to add new users to your website. Click "Website Users" from the left-hand menu. Click "User Settings" from the left-hand menu. Change the drop-down titled "Allow visitors to create accounts:" to "NO"
Not allowing visitors to create an account. If you have not allowed registration on your website, or if you have acquired a new customer in another way, you will need to manually add them as a user. 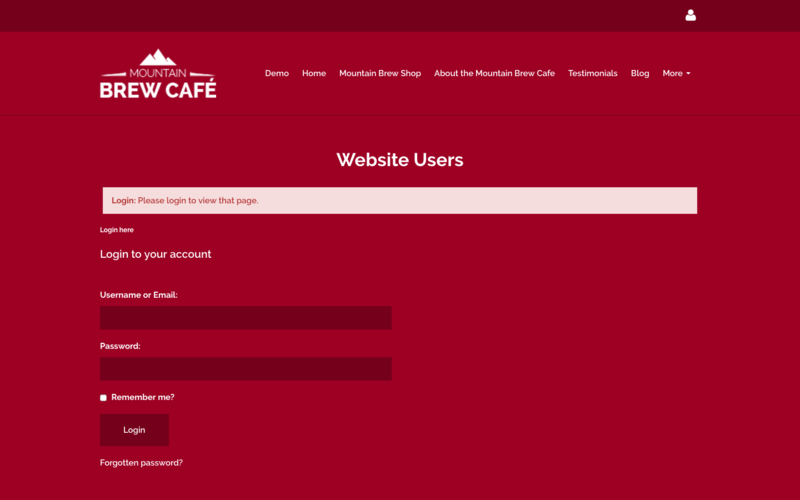 To add a new customer, click "Add New Website User"
Add a username, password and email address for your customer. Filling in the details for your new user. Once you have republished your website, your new user will be able to log in with the username and password you have just set up. If you want to allow some of your website's users to access one part of your website, but not others, you can restrict access on a page to certain groups only. You can assign your website's users to groups that you set up. You can use this to allow certain groups access certain pages of your website. Or, you can also employ groups for your own organisational purposes. 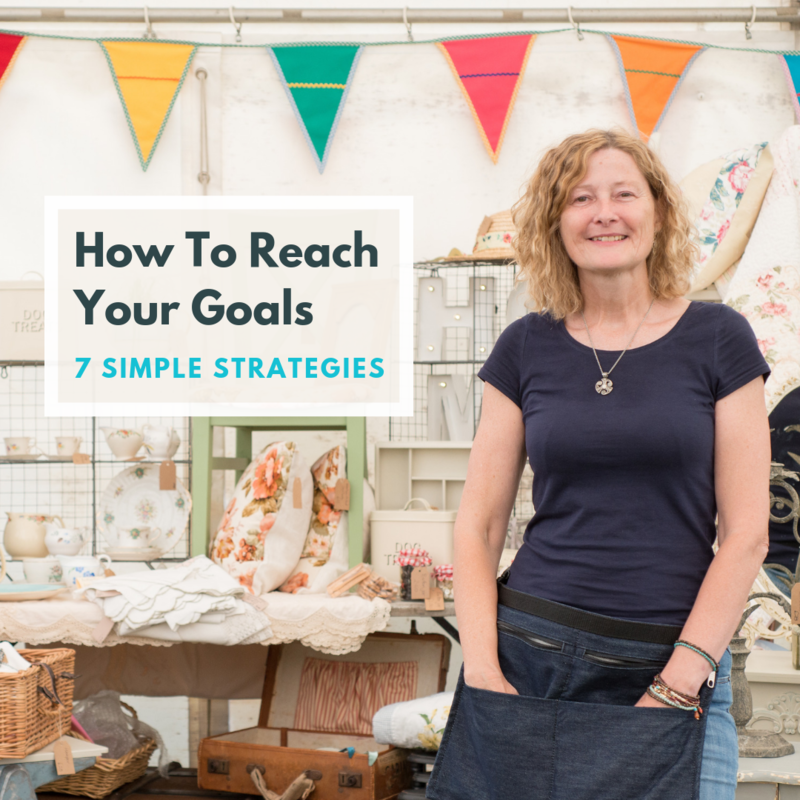 For example, you can set up a group for customers that you have collected at a trade show, and another group for customers who have signed up via your website. Click "User Groups" from the left-hand menu. 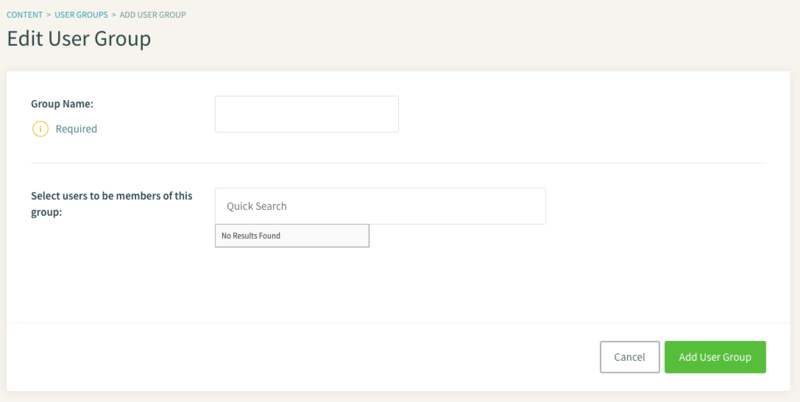 Using the search tool under "The following users are members of this group:", you can assign already registered customers to your new group by ticking next to their name. Creating a user group and adding users. Click "Add User Group" to complete setting up the group. Change the drop-down titled "Default Group" to your desired group. 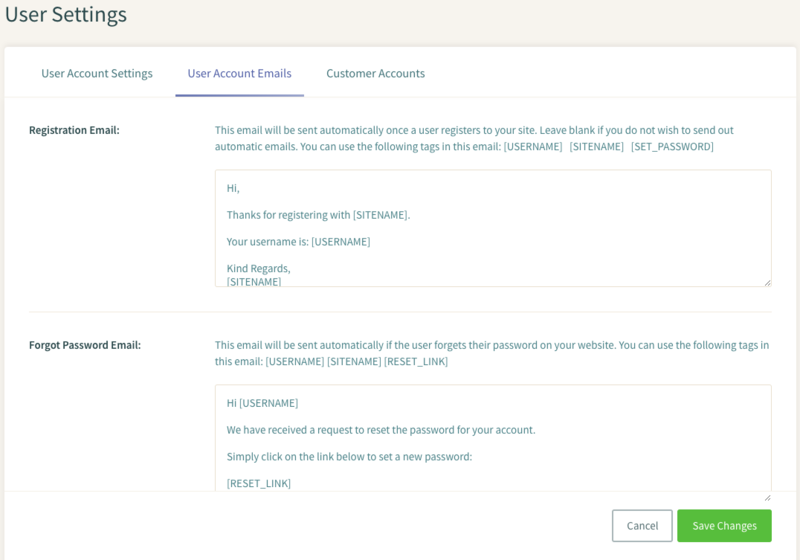 When a customer registers to your website, an email will automatically be sent to them. They will also be sent an email with a reset link if they forget their password. You can customise what these emails say! Click "User Account Emails" from the top tabs, and enter your email text. You can password protect pages, or sections (such as the shop), of your website. This will mean that only your website's users (or a specific user group) can access it. Click "Page Options" next to the page, or section, you want to protect. Click on the tab titled "Security". Set the drop-down titled "Password Protected" to "YES". Restrict the page to any groups you have set up by checking them under the "Only Allow Users From Following Groups:" field. An example password protected page. You have certain settings for your user accounts that are geared towards using them with your shop. 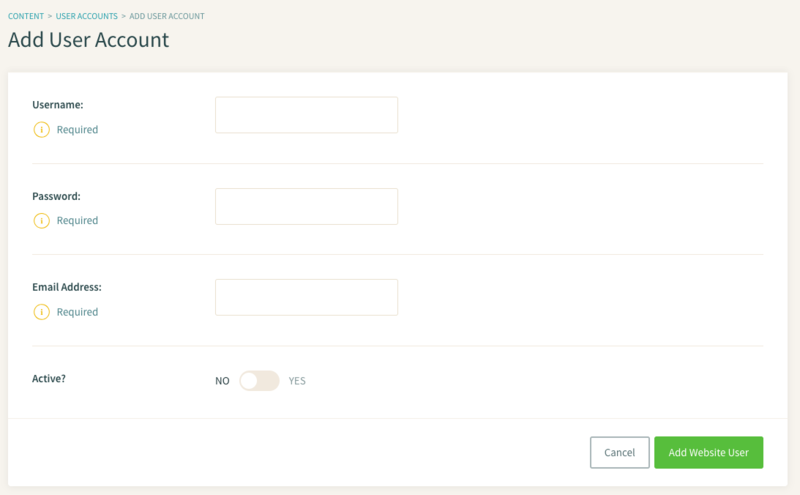 You can specify that accounts are automatically created when a customer goes through checkout, you can make it so a customer has to create an account to checkout and you can add or remove the login link on your shop pages. Click "Customer Accounts" from the top tabs. 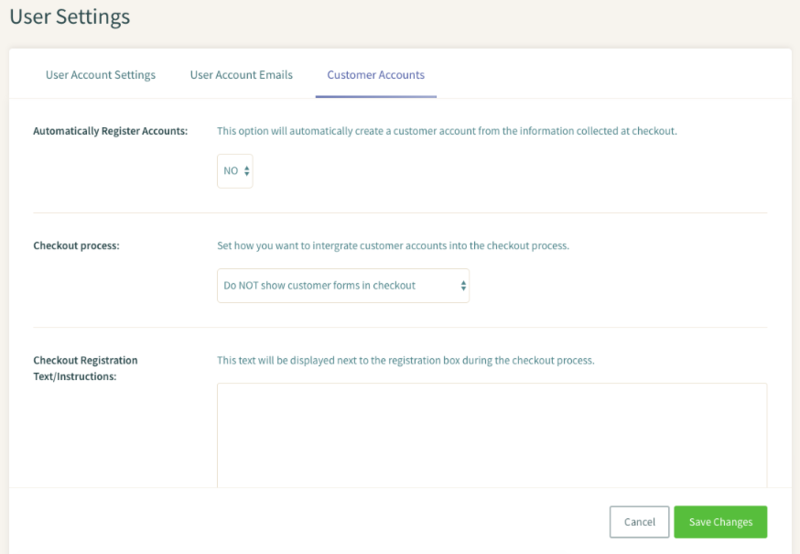 The shop settings for customer accounts. Customise your settings as you wish and click 'Save Changes' to confirm.